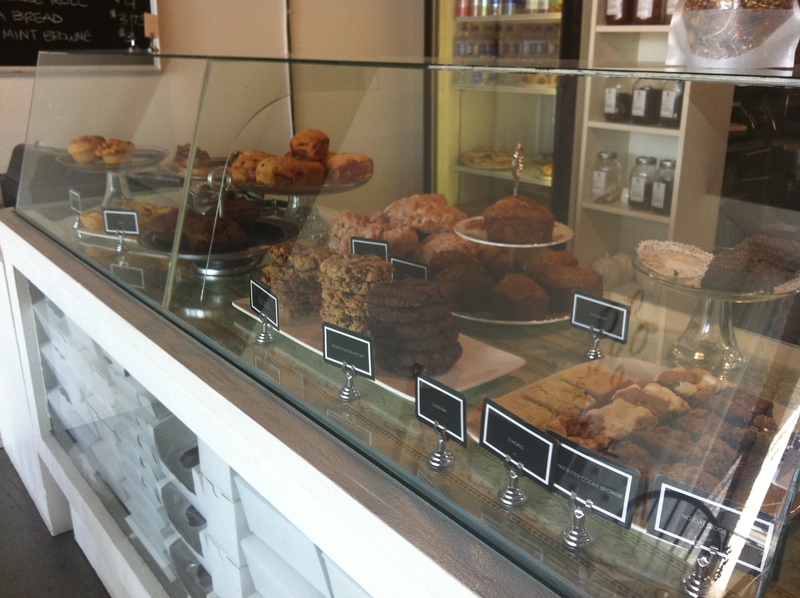 The Gluten Free Epicurean does it again. Located conveniently 2 doors down from Collage Collage, it is the perfect stop for post-art tea and snacks. 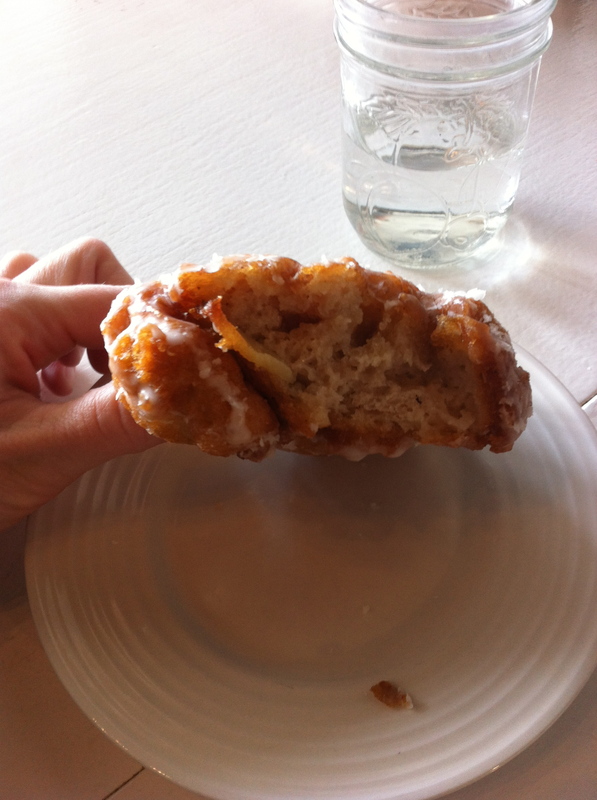 This time I chose the Gluten and Dairy-free Apple Fritter. I was not disappointed, it had big chunks of apple throughout, perfect glaze and was soft and chewy on the inside. I have a problem, I am a chronic over-mixer. I don’t remember having this problem with my early baking. Really seems to have come on since receiving my super awesome stand mixer. I notice it most when I make cupcakes. 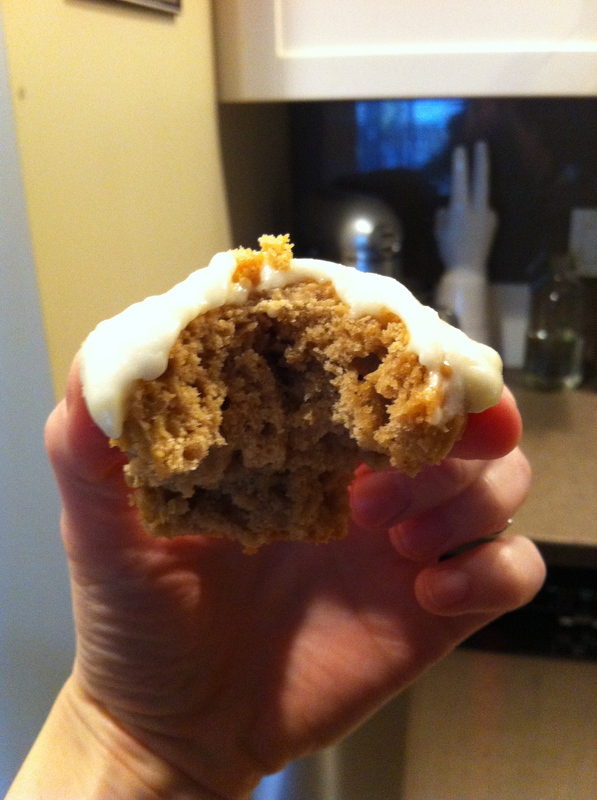 This week, for Lauren’s birthday, I made some Chai Tea Cupcakes. 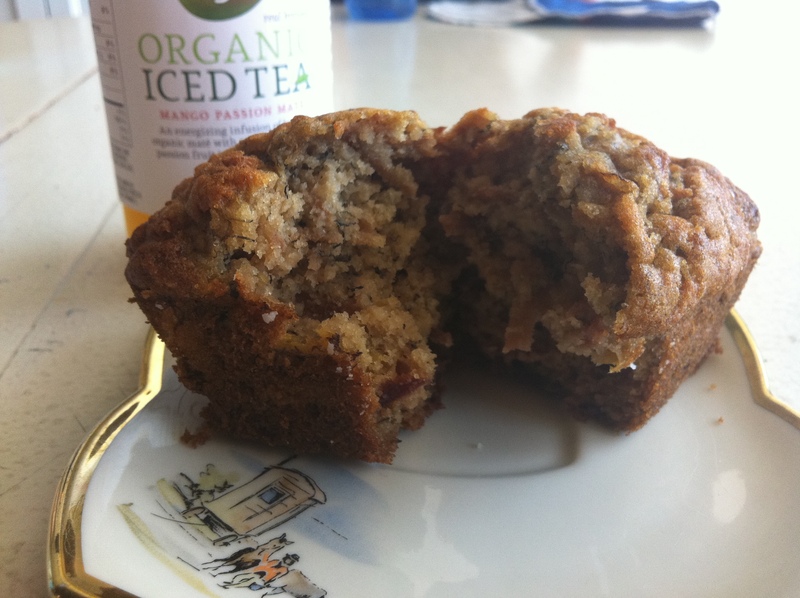 I didn’t modify the recipe at all, word for word, straight out of Martha Stewart Cupcakes. They tasted great, especially with the cream cheese icing. But they were dense. More of a muffin. No hints of light and moist cake, like a cupcake should have been. I know the rules. Cream the fat and sugar starting on the lowest speed, working up to high speed. And don’t over mix. I remind myself every time. Don’t over mix. What else can I do. Am I destined to go back to hand mixing, with a wooden spoon? I’m not sure I would actually mind that much. I’ll need some new, light weight, mixing bowls. But I do love my stand mixer…. Any suggestions? 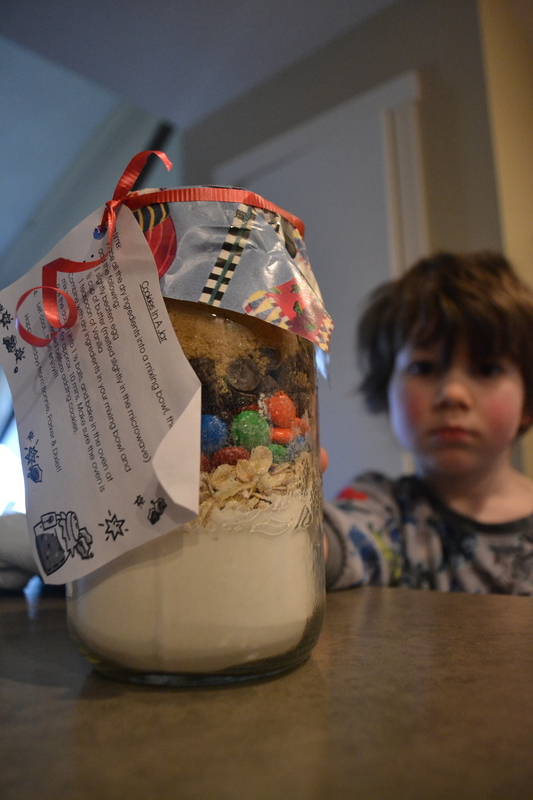 Christmas Eve we received cookies in a jar from our friend Bonnie. I’ve seen these before but haven’t assembled them myself. Bonnie got crafty and I think they turned out great! Perfect for a Sunday afternoon afternap. 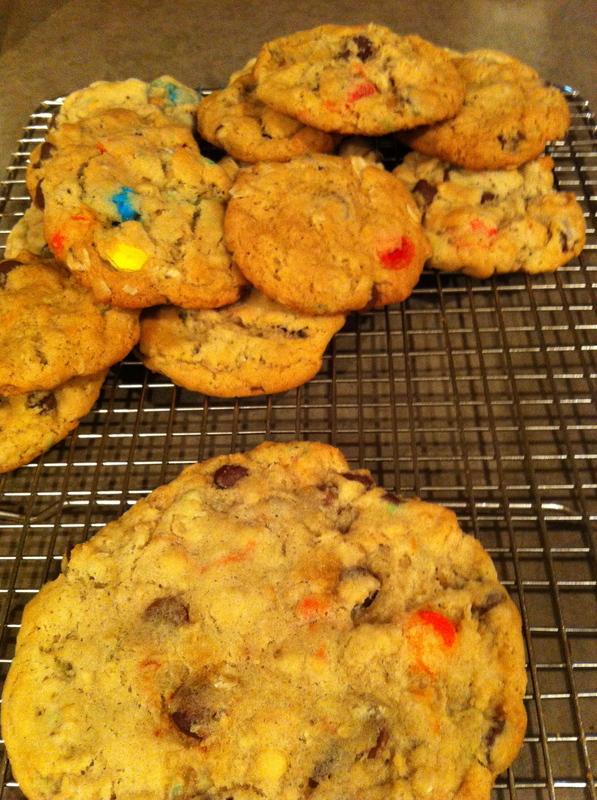 The baked cookies were chewy and delicious, the way a chocolate chip M&M cookie should be! My only advice, to myself if ever gifted another baked good in a jar, or others with said jars waiting to be baked–fully mix the dry goods before adding to the wet. Beginners Baking 101–rookie mistake. I didn’t soften the butter enough, and was trying to short cut. Short cuts and baking don’t mix. A few of my cookies ended up with little pockets of baking soda that hadn’t fully encorporated. Well, it clearly has been ages since my last update. Took me a while to figure out how to post. Change and I don’t always get along. Had tea this morning with the lovely Ashala. Her new farming/business venture inspired me to make some dirt cupcakes. 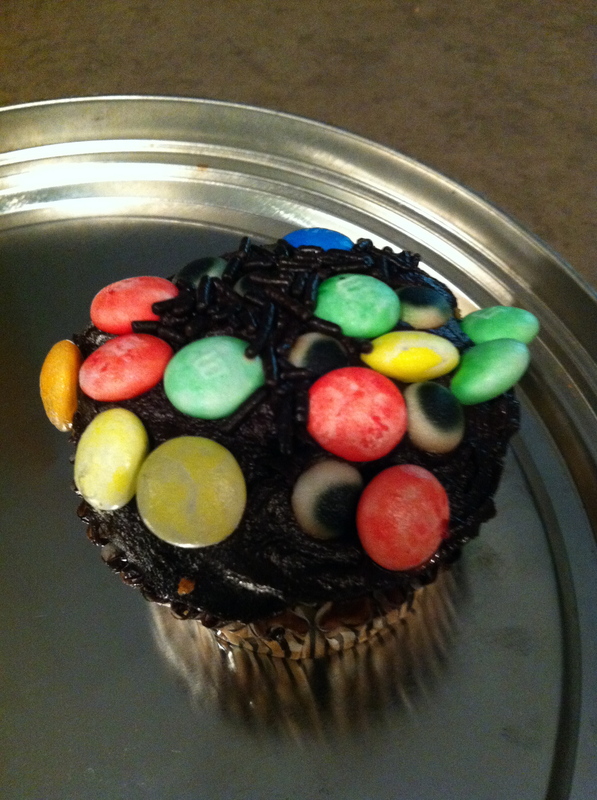 Well, cupcakes that look like dirt. Sound appetizing? The ‘dirt’ is Oreo cookie crumbs, pretty tasty. I didn’t modify any recipes for these. Straight up Martha, Red Velvet Cupcakes with Cream cheese icing. The decorating idea came from Hello, Cupcake. 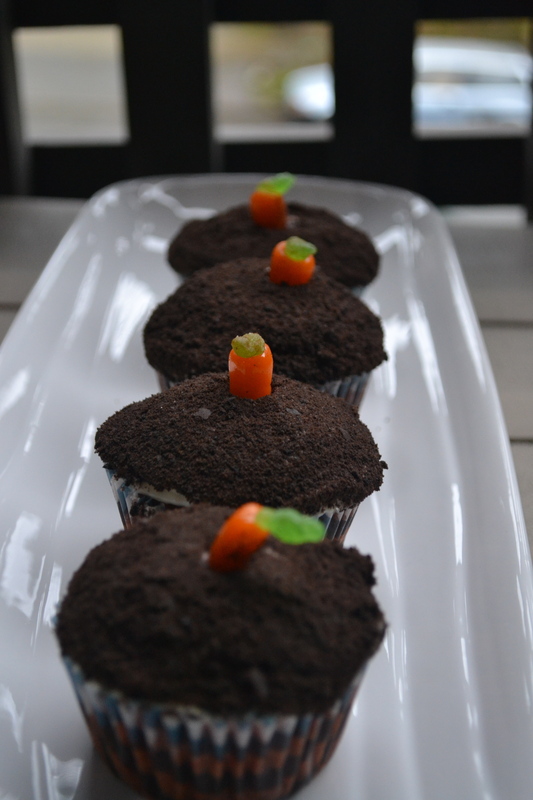 Slightly modified, I have the carrots growing out of the cupcakes instead of harvested, as shown in the book. What new business venture, you ask? Ashala recently finished up farm school, leased some land with 2 classmates and has started a CSA for canned goods. The business is called Three Feet Below. I’ve bought a half share and throughout the fall will receive jams, pickles, preserves, sauces, salsas etc. Grown and canned with love. Its going to be a tasty winter!! 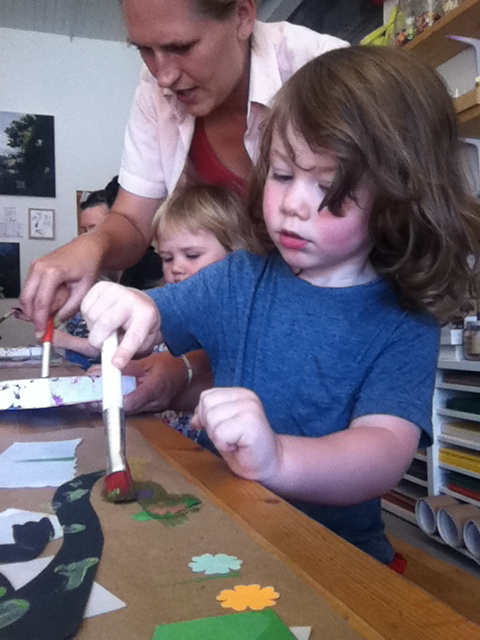 Yesterday a few of us took our toddler crew to Collage Collage for a drop in art class. The ‘teacher’ Liz was great with the kids. Kept their artist fingers focused and was very patient with them. After story time Liz lead them through creating a picture based on the story. The tots had the opportunity to tear and cut paper, glue, (fave part–using the glue stick), colour with pastels, finger paint and paint with brushes. E enjoyed it and I will deffo take him again! After crafting we went a few doors down and discovered a new bakery!! The Gluten Free Epicurean. She’s been open about 8 months, but new to me, I haven’t been over to that block in about as long. 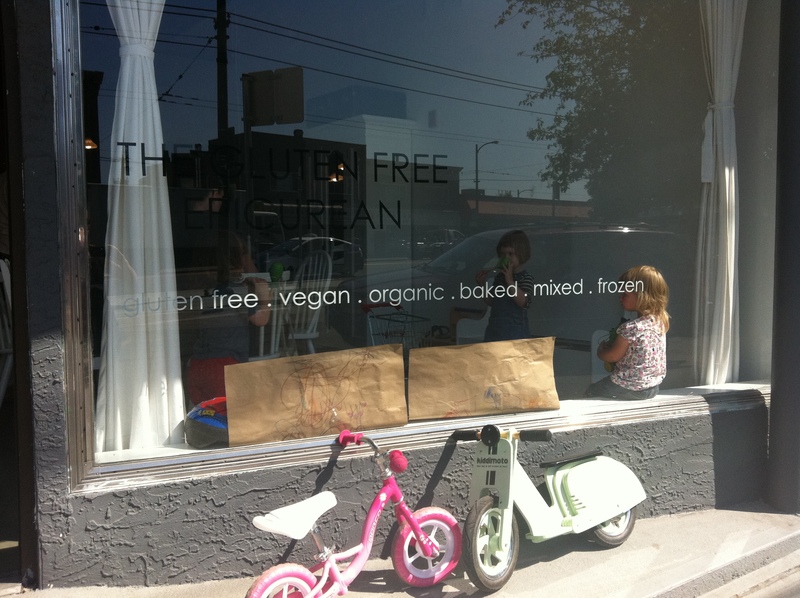 The space is lovely, all white and kid friendly–in a not over the top kid focused way. There is a toy chest in the corner, with a play stove and shopping cart that kept the kids occupied after snack. I had sugar free banana bread. It was fantastic! Moist and sweet. With shredded apple in just the right consistency. Natasha had a chocolate espresso muffin that was great too. The Epicurean also has a freezer so you can ‘take and bake’! Recently my good friend Christina graduated with her B.Ed from UBC. This was her second degree completed in the last few years. In which time she also had a child. Serious accomplishments. To help us celebrate, her in-laws took both of our children for a sleepover so we could go out and attend the show our husband’s band was playing. Not just a sleepover, a sleepover with Spiderman costumes from which we didn’t need to pick them up until 5 pm–the next day! And when we picked them up we were to stay for a BBQ. Yes, I’d say both of these events are sponge worthy. So I made one. I’m loving how easy this recipe from my British Baking book is. 4 eggs, weighed in their shells, then equal parts butter, flour and sugar–done and yum. A little whipped cream, a few strawberries. This is the second time I’ve made this Victoria Sponge. First one was slightly more moist. Next time, one less minute in the oven. 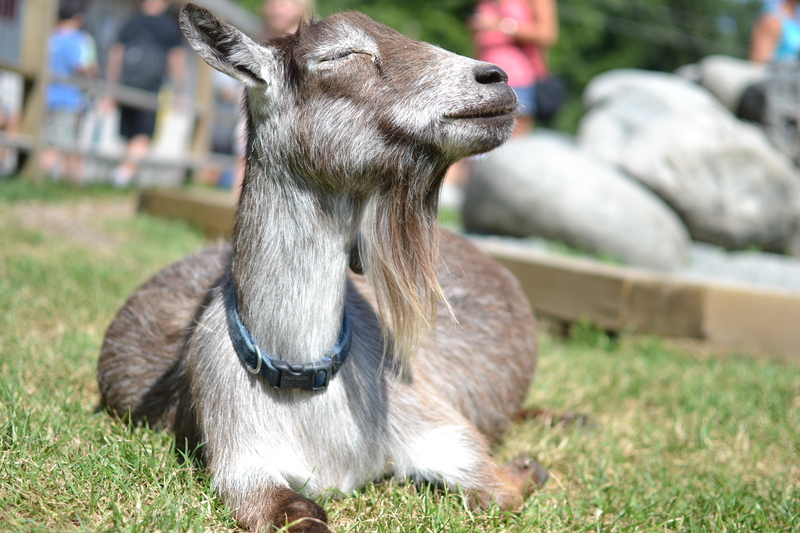 Also, this week we went on a field trip to Maplewood Farm. This goat caught my eye. I have done quite a bit of baking lately, but not much picture taking. 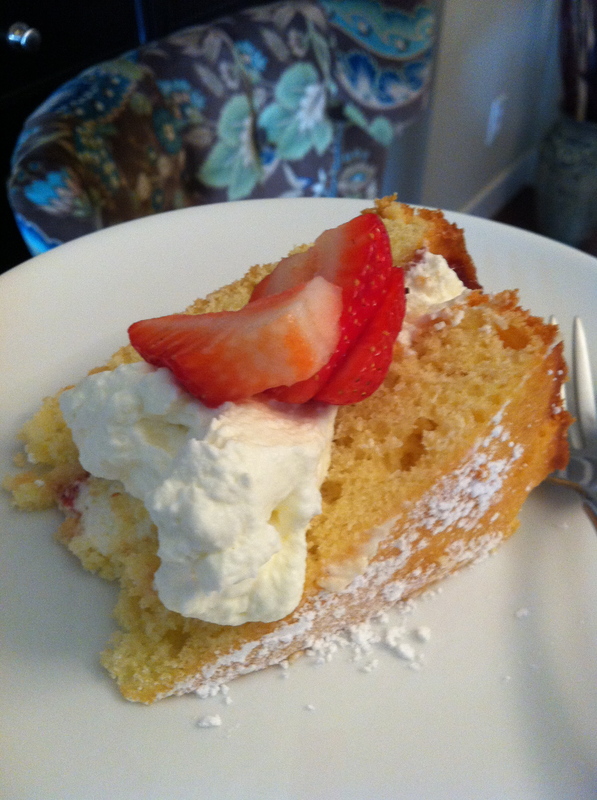 I made my first Victoria Sponge, with whipped cream and strawberries. So easy, and delicious. Recipe from my British Baking book, Peyton and Byrne. Took that cake to a tennis party-Wimbledon’t. Also from that book I made a Lemon Swiss Roll for Shannon’s birthday. Complete with homemade lemon curd. Granted I had to rescue the curd with a rue as it wasn’t as curdy as it should have been, the finished product was also delicious–should have made two. 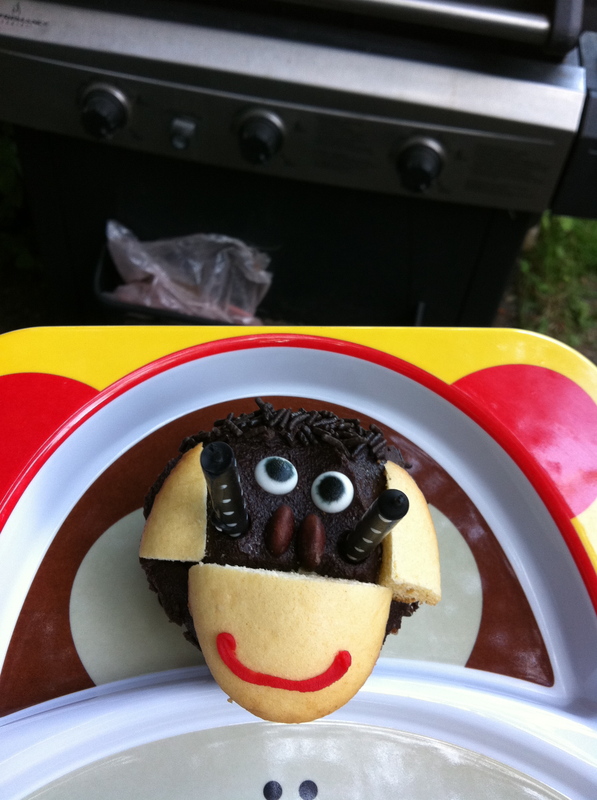 Brownies, banana spelt mini muffins and banana monkey cupcakes. These were for lovely Olive’s second birthday party. Banana pecan cupcake recipe from Martha Stewart’s Cupcakes, minus the pecans. Chocolate frosting from Hello Cupcake.